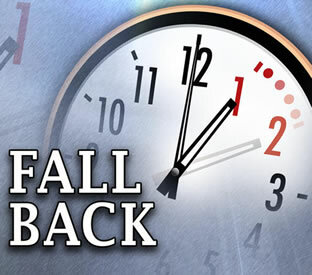 (Oct. 29, 2009)--When you go to bed Saturday night, remember to set back your clocks one hour. At 2 a.m., Sunday, Nov. 1, daylight saving time (DST) ends for the year. >> Employees working during the change to standard time will receive credit for nine hours worked for that completed shift and should be reflected on the employee time record. Work schedule adjustments within the seven-day workweek may be made by departmental supervisors to prevent the accrual of overtime or state compensatory time hours. For more information, contact UTSA Human Resources at (210) 458-7891. Since it will feel like we are losing an hour, there are some "inconveniences," according to Helium.com. For some, the shift of one hour of daylight from the evening to the morning requires only minor adjustment, but for others the adjustment period can take weeks. Because the body's inner clock (circadian rhythms) is abruptly unable to sync up with its external environment, it can result in fatigue, sleeplessness, irritability and other discomforts. On the flip side, some experts believe that DST can actually help alleviate depression, as people must get up earlier once the time changes. Officially, it's "daylight saving time," not "daylight savings time." But, don't feel bad if you thought there was a final "s" on "saving"; far more people Google the incorrect phrase than the correct one. DST has mixed effects on people's health. Transitions into and out of DST can disturb people's sleeping patterns, for example, and make them more restless at night. Night owls tend to be more bothered by the time changes than people who like mornings, Finnish researchers concluded last year. When daylight saving time ends in the fall, heart attacks briefly become less frequent than usual. There's a spike in heart attacks during the first week of DST, according to another study published last year. The loss of an hour's sleep may make people more susceptible to an attack, some experts say. People are safer drivers during daylight hours, and researchers have found that DST reduces lethal car crashes and pedestrian strikes. In fact, a study concluded that observing DST year-round would annually prevent about 195 deaths of motor vehicle occupants and about 171 pedestrian fatalities. A U.S. law signed by President George W. Bush in 2005 extended the length of daylight saving time by four weeks. It now begins at 2 a.m. on the second Sunday in March. It ends on the first Sunday in November. Also in 2005, Kazakhstan abolished DST, citing negative health effects. The country's government reportedly calculated that 51.6 percent of Kazakhs responded badly to the time change. Many other countries observe daylight saving time, but not all do so on the same day. That can create confusion for international travelers, business communications and more. Daylight saving also can cause confusion close to home. In March 2007, a Pennsylvania honor student was mistakenly accused of threatening his school with a bomb. He actually had called an automated line to get info about scheduled classes. Someone else made the bomb threat an hour later. Two states -- Arizona and Hawaii -- and four U.S. territories -- American Samoa, Guam, Puerto Rico and the U.S. Virgin Islands -- don't observe daylight saving time. Indiana adopted DST in 2006. Local time determines when DST begins, so America's eastern time zone makes the switch before the rest of the country. This Sunday, cities such as New York and Atlanta will be two hours ahead of the central time zone, instead of the usual one-hour difference, from 3 a.m. to 3:59 a.m. EDT. New York City will be four hours ahead of Los Angeles -- instead of the usual three -- from 3 a.m. to 5:59 a.m. EDT. Daylight saving time was first used during World War I, as part of an effort in the United States and other warring countries to conserve fuel. In theory, using daylight more efficiently saves fuel and energy because it reduces the nation's need for artificial light. The first American to advocate for daylight saving was Benjamin Franklin. He realized in 1784 that many people burned candles at night yet slept past dawn in the summer, wasting early-morning sunlight. The effect of DST on energy use has changed over time and varies from place to place. Experts even disagree on whether DST still saves the nation energy. But, so many people like to "spring forward" that it might be hard for officials to end the tradition, even if they determined it's wasteful.